The RayBio® Phosphorylation ELISA kits are very rapid, convenient and sensitive assays that monitor the activation or function of important biological pathways in cell lysate samples. By determining phosphorylated protein in experimental model systems, researchers can verify pathway activation and simultaneously measure numerous different cell lysates without spending excess time and effort in performing Western Blot analyses. Interested in phosphorlyation and cell signaling signaling pathways? 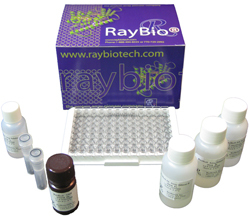 RayBiotech now offers a Pick-Your-Pathway Program which allows you to quickly select your own panel of signaling molecules to create a custom multi-kit phosphorylation ELISA. Simply choose any 2 or more of our in-stock, Phosphorylation ELISA kits, and we will combine them into a multi-box kit for you. This program has a great discount built in, allowing you to perform pathway analysis while saving money. This Sandwich ELISA kit is an in vitro enzyme-linked immunosorbent assay for the measurement of phosphorylated protein. An specific capture antibody (anti-pan-antibody or anti-phosphorylated antibody) has been coated onto a 96-well plate. Samples are pipetted into the wells and target protein present in a sample is bound to the wells by the immobilized antibody. The wells are washed and anti-phosphorylated antibody or anti-pan-antibody is used to detect target protein. After washing away unbound antibody, secondary antibody is pipetted to the wells. The wells are again washed, a TMB substrate solution is added to the wells and color develops in proportion to the amount of target bound. The Stop Solution changes the color from blue to yellow, and the intensity of the color is measured at 450 nm. A431 cells were treated or untreated with 100 ng/ml recombinant human EGF for 10 min. Cell lysates were analyzed using this phosphoELISA and Western Blot. 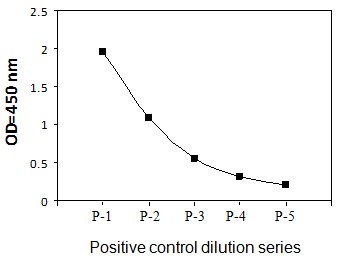 The A431 cells were treated with 100 ng/mL recombinant human EGF for 20 minutes to induce phosphorylation of EGF R. Serial dilutions of lysates were analyzed in this ELISA and by Western blot. Immunoblots were incubated with anti-phospho-EGFR (Tyr 1086).